On 14th June 2016, Menard held a pre-launch press event at Menard Institute Paris to announce the new Embellir line. 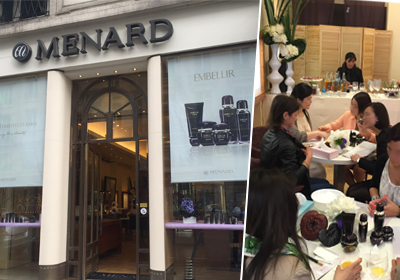 Around 100 journalists and bloggers took part in this event to receive explanation from Menard staff on the new Embellir line and experience the new Embellir products through mini skin care treatments. The guests showed great interest in the effects of the Reishi mushroom(※) used as the main active ingredient in the new Embellir line, enjoyed the feeling of the new products and thus look forward to their launching. As for Nippon Menard France, six new Embellir products will be made available for European customers on 1st September 2016.